There’s something about a number with a crowd of zeros behind it that grabs people’s attention. As the calendar approached its version of an odometer rollover, beer magazines, and others, acknowledged time’s passing by compiling lists of “bests”. In General, the tributes focused on notable people, dates, and events, all worthy of recognition, but the most significant contribution to beer in the last century was a simple piece of tin – the bottle cap. When the 1900’s began, most people drank beer in taverns, and seldom at home. Off-premise packaging was impractical. On occasion they did fill a growler at the local tavern, but it had limitations. Little more than a bucket with a fitted lid, beer in growlers spoiled rapidly. Bottles of the time were no better, with a design unsuited for mass-production. True, beer had been bottled with hand fitted corks and swing tops for more than a hundred years, but the process was unwieldy, expensive, and the bottles frequently leaked. It was a situation that directed most of a brewery’s production into kegs. It wasn’t until the early 1900’s that brewers found a practical answer. 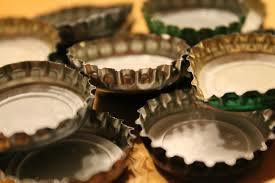 First patented in 1892 by William Painter, the crown cap, so called because its shape was similar to crowns worn by royalty, provided brewers the means to mechanically seal bottles. Unfortunately, many of the initial crowns leaked. Then, in 1907, a backing of composite cork was applied. It improved the fit and eliminated leaks. With the problem solved, bottled beer production and sales took-off. Beer lovers no longer had to visit a bar. Beer could go anywhere, and the modest, little piece of pressed tin changed American drinking habits forever. Bottled beer neatly addressed an unfilled niche and off-premise consumption grew from a mere trickle to a mighty river of beer. One Hundred years after its birth, the lowly bottle cap, unsung hero of beer sales, continued to bring beer home, unchanged and unchallenged, even as the millennium rolled over.